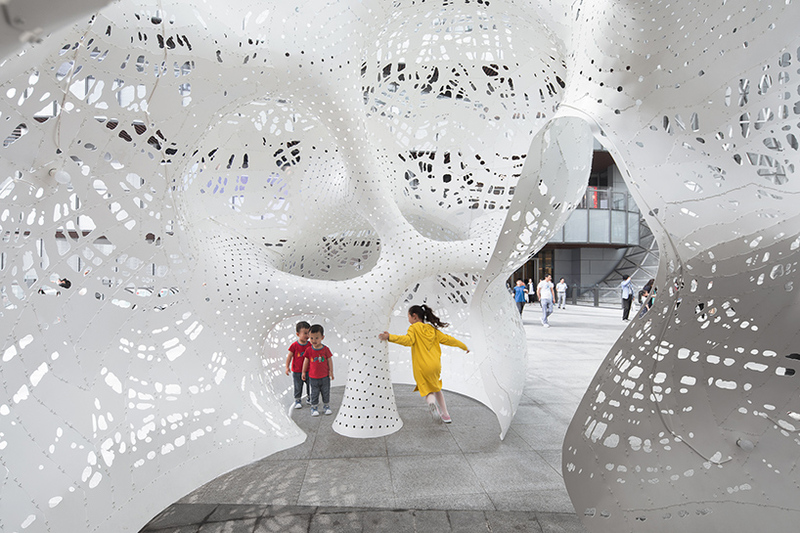 on the elevated plaza of the suzhou center in china, MARC FORNES / THEVERYMANY has installed a large-scale outdoor pavilion with an undulating enclosure that punctuates the bustling urban landscape. 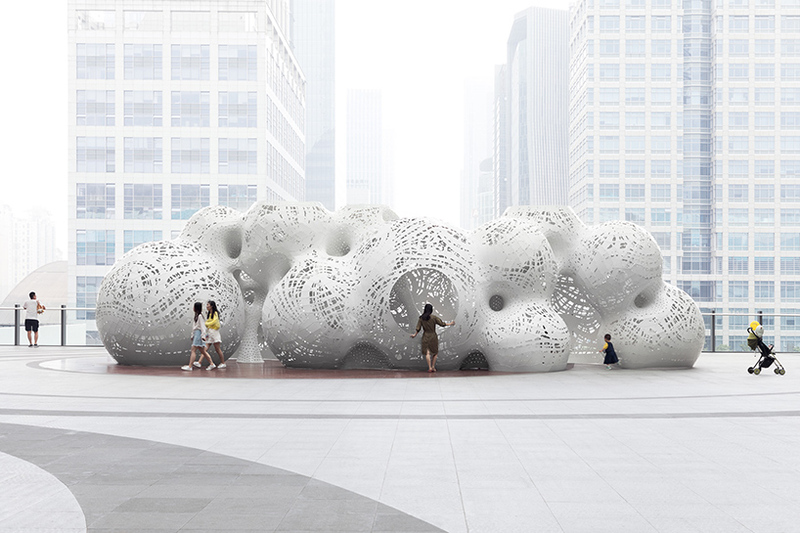 ‘boolean operator’ seemingly bubbles up from the ground and appears both monumental in scale and fragile with its white aluminum façade. 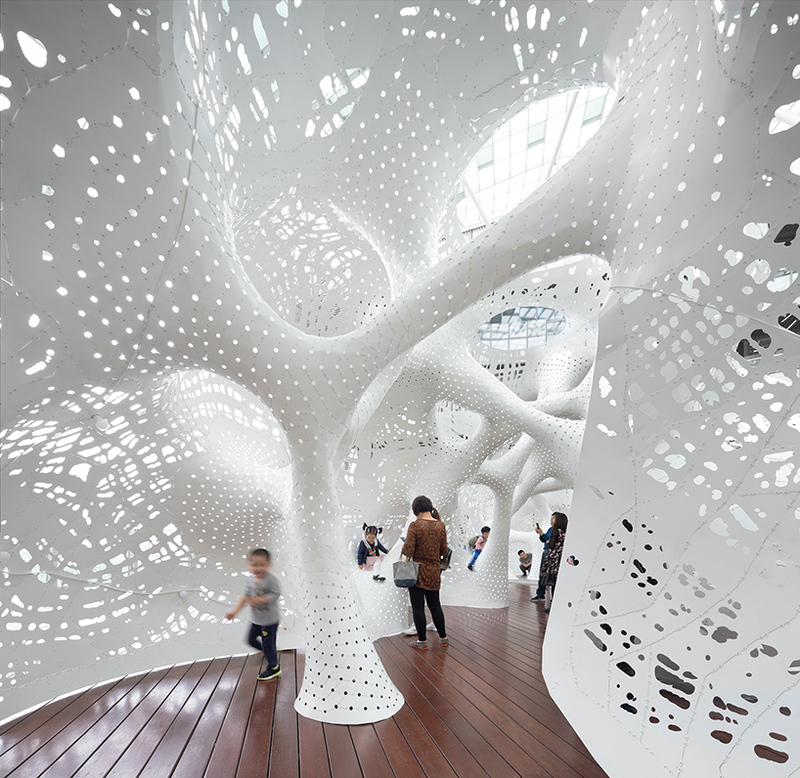 the structure’s porous shell draws from celebrated author jules verne’s ‘voyages extraordinaires’, particularly the ship that takes captain nemo to the bottom of the sea, which is described as both a tactical vehicle and a lush interior. 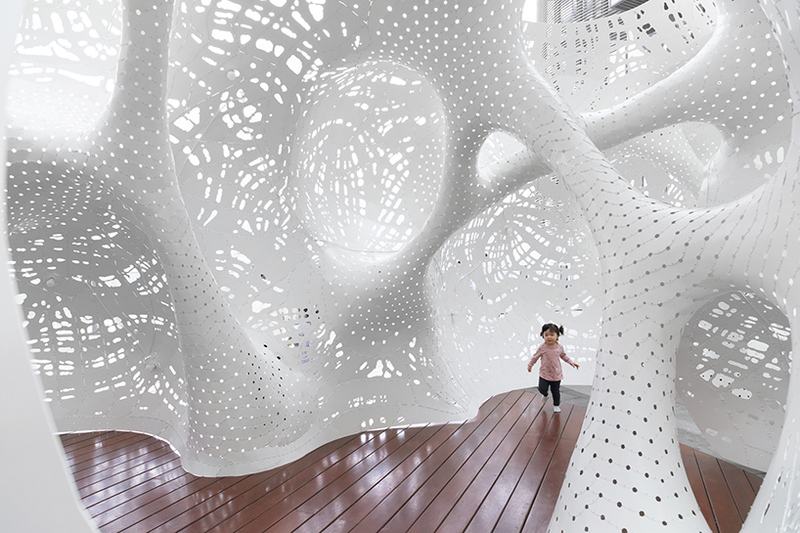 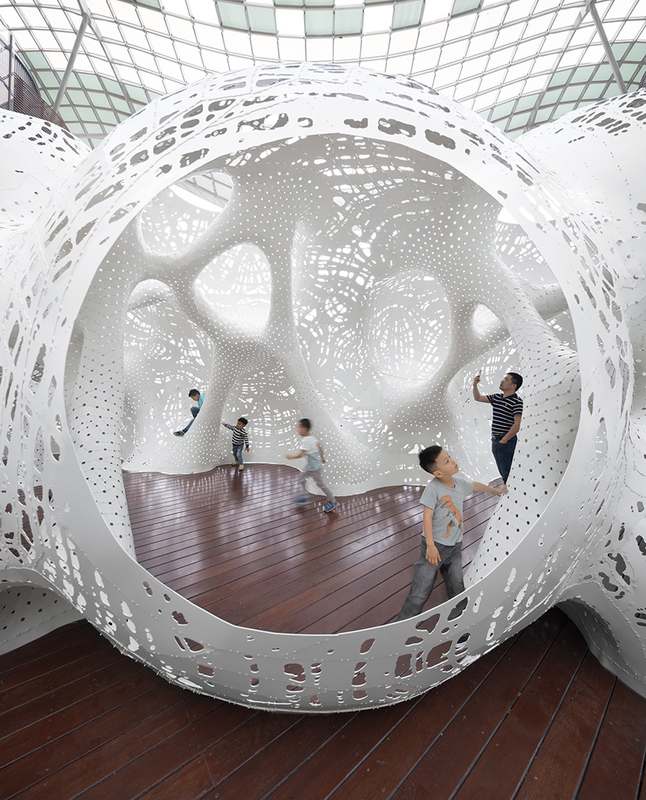 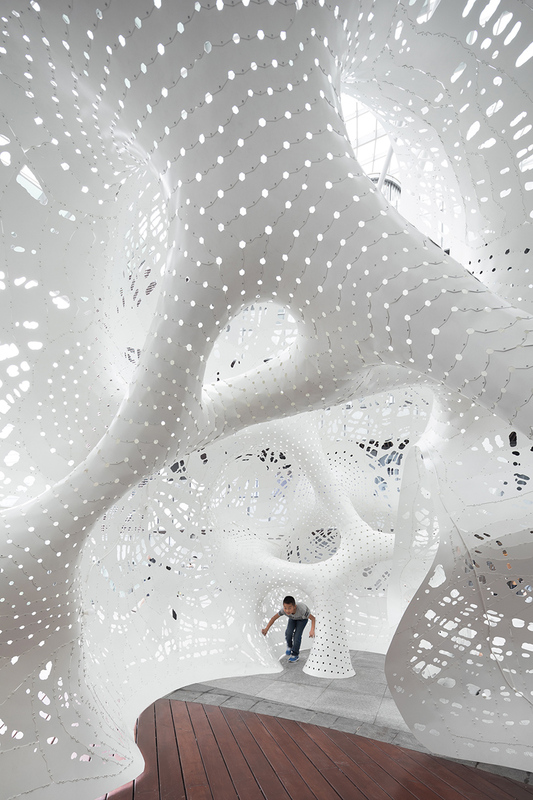 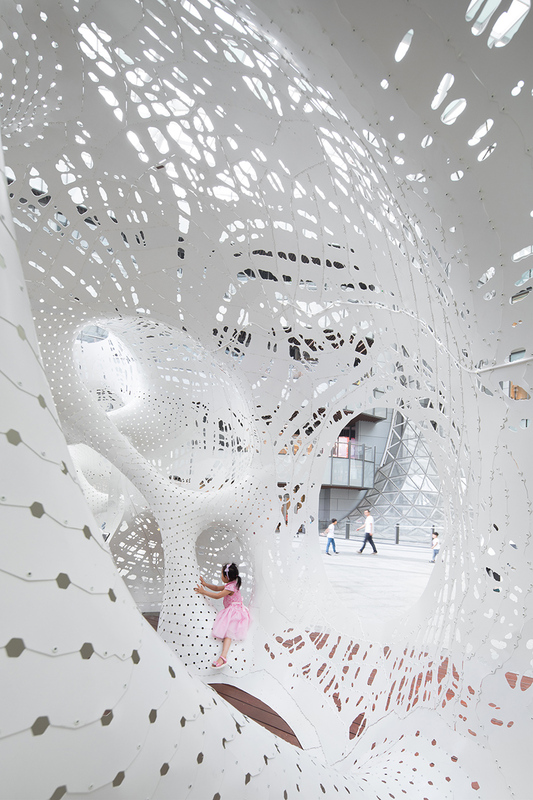 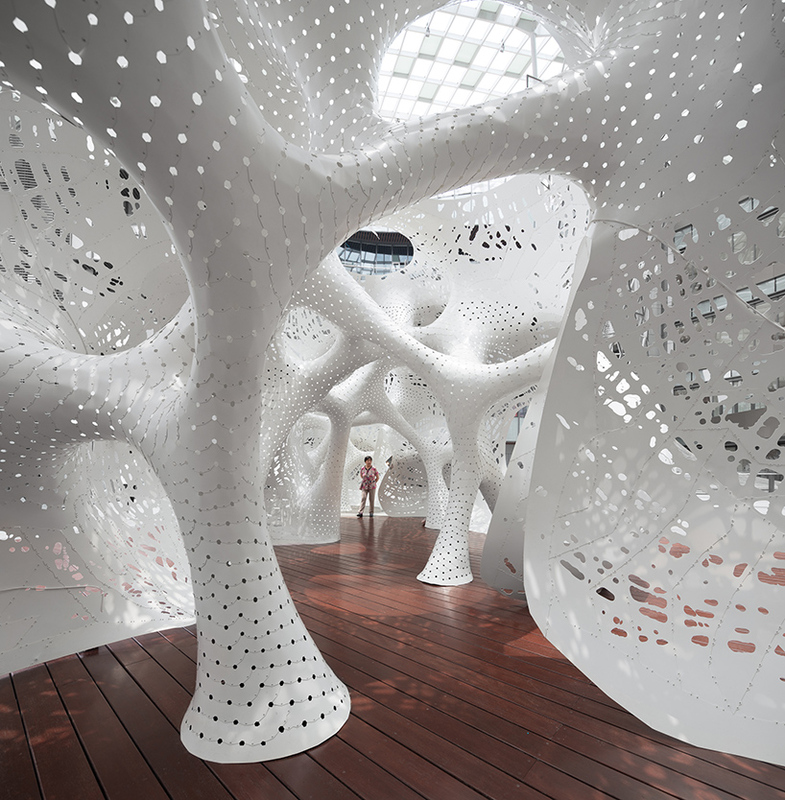 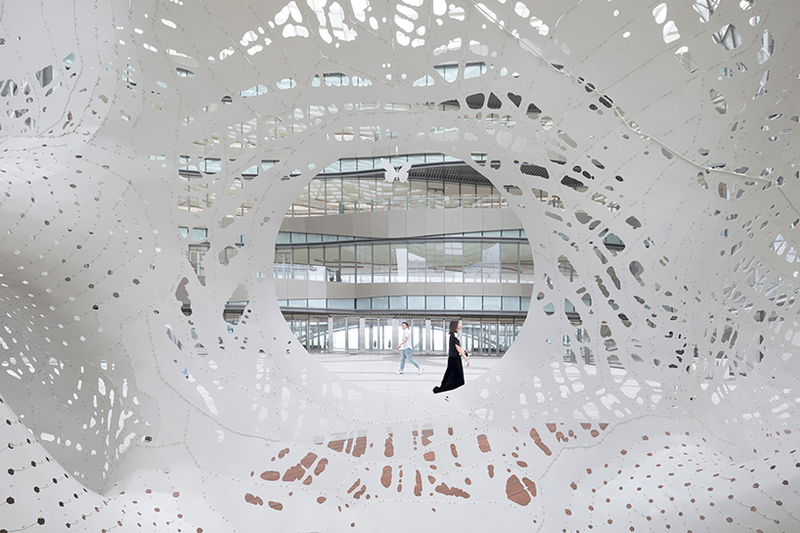 across the world from its studio in brooklyn, MARC FORNES / THEVERYMANY has generated a continuous surface that grows outward from a network of columns, peeling open into an enclosed shell. 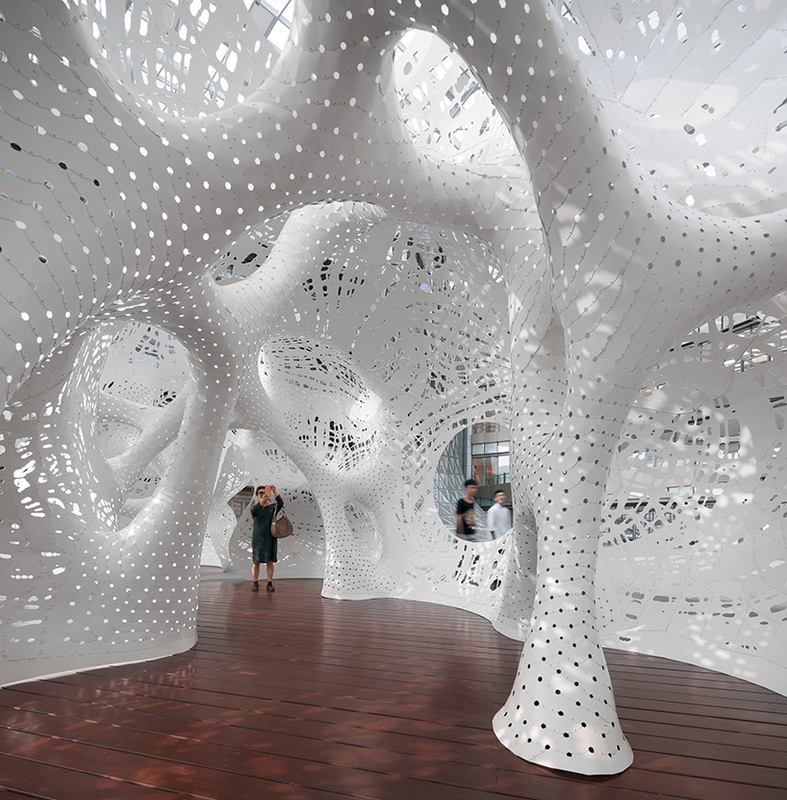 topologically, ‘boolean operator​’ — which has been created for the jinji lake biennial — shows no simple division between envelope and support, but the two are made from a continuous skin that supports itself throughout. 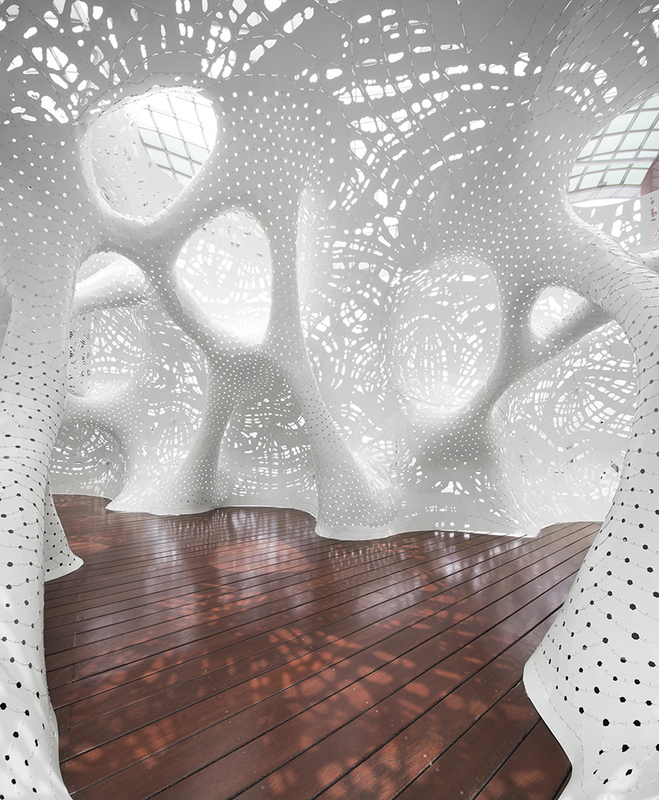 akin to unwrapping, what is inside of the columns eventually becomes the outside of the shell. 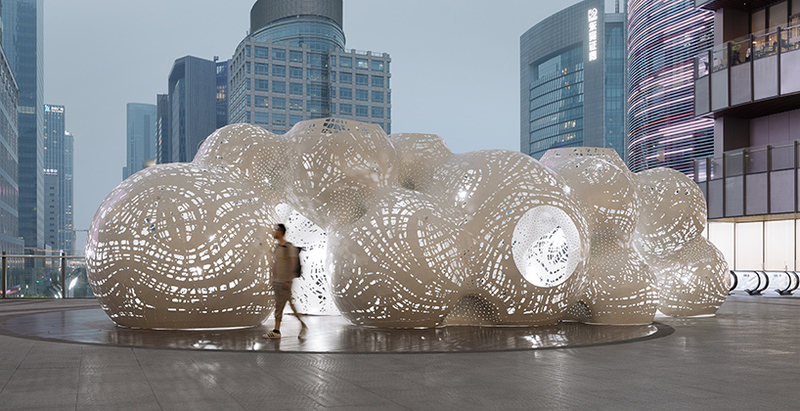 the structure maintains a light impact on the ground, while the intricacy of the skin simultaneously asserts a sense of density​. 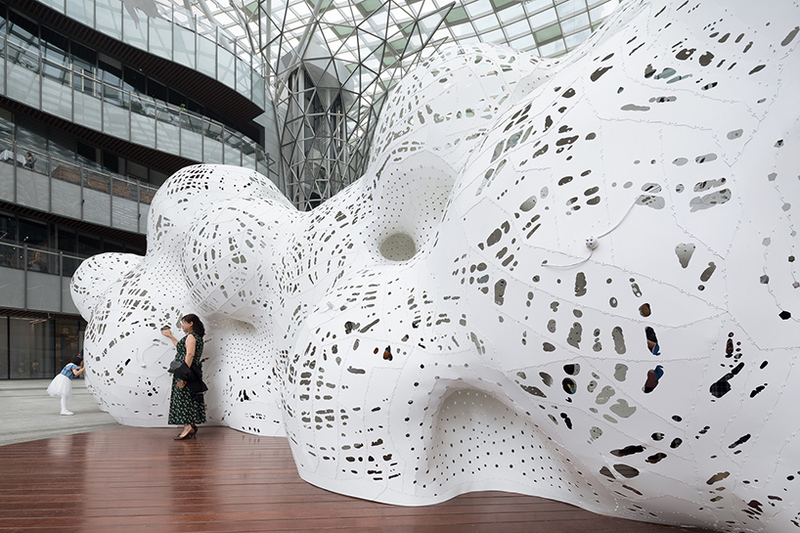 doubly-curved surfaces cast irregular shadows on the surrounding landscape, distorting the sense of space and depth. 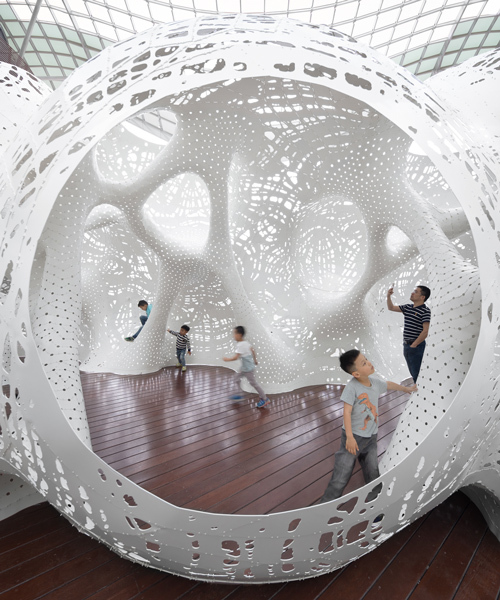 immersive tunnels and pathways become an irresistible ​terrain ​for interaction and play. 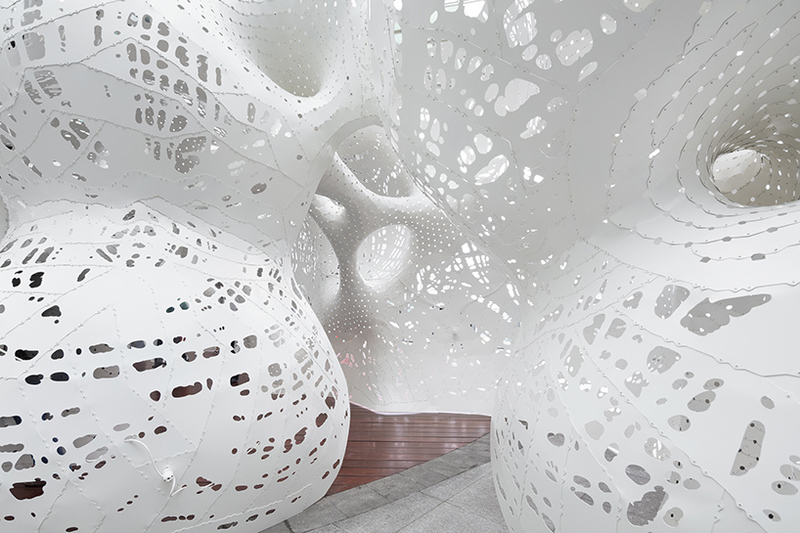 meanwhile, a constellation of openings are also the result of a kind of exploration — crawling agents of a ​computational search protocol​ find their way across the aggregated mesh.